Is the real future of music interfacing directly with our brain? different answer. Nope. Brain cap. Brain cap it is. The folks in Computer Music Research at Plymouth University are working on the problem. (via interactive tech blog pasta and vinegar) They've got a brain cap for "innovative portable music devices" (what, you think this is bigger than the keytar?) and music therapy. 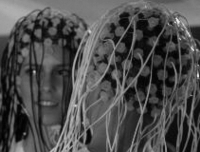 Here's the tricky bit: what do you do once you have all those EEG signals? Ultimately, you have to create "responsive environments" and "imaginative music grammars". being able to pull music out of our brains.